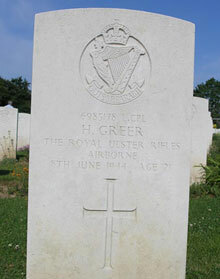 Henry Greer was a close friend of Joe Hall and Lance Corporal Ruddell. The 6th June 1944 was the day the allies landed on the beaches of Normandy. The 1st Royal Ulster Rifles were part of the 6th Airborne Division who landed by gliders in and around the town of Ranville in Normandy. 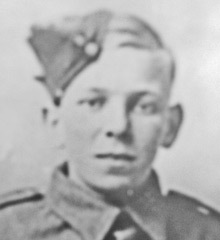 Lance Corporal Henry Greer was killed in action during the battalion’s next objective, the town of St. Honorine, on 8th June 1944.